Indiana lies in the heartland of America, but gardeners here grow more than corn. 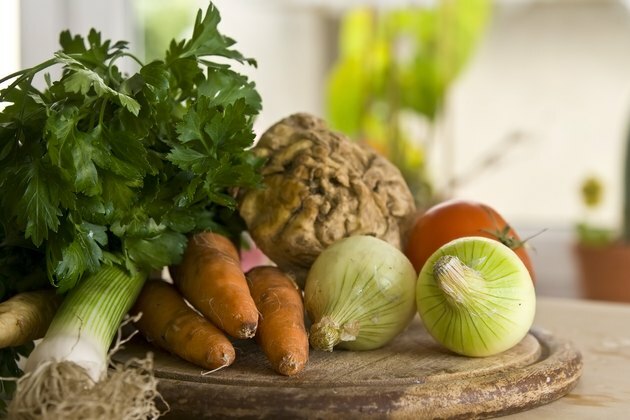 Many vegetables and fruits will flourish in the state, if you pick the right varieties. For most of the territory above Indianapolis, the U.S. Department of Agriculture plant hardiness zone is 5b. USDA zone 6a covers most of the southern part of the state, as well as stretches of land around South Bend and Fort Wayne, and the far southwestern corner, including Evansville, is zoned 6b. 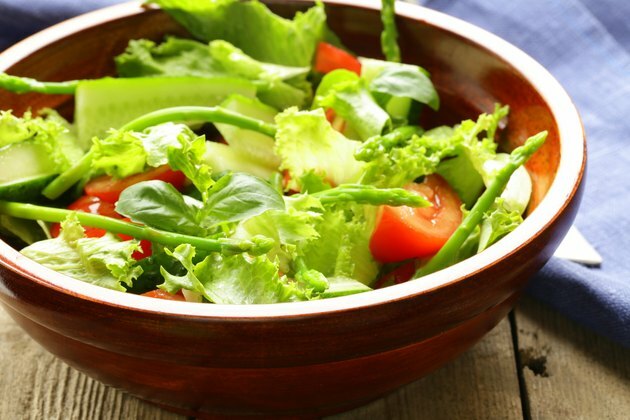 A fresh garden salad tossed in a bowl on an outdoor table in the summer. An assortment of freshly picked tomatoes and peppers for sale at the farmer's market. 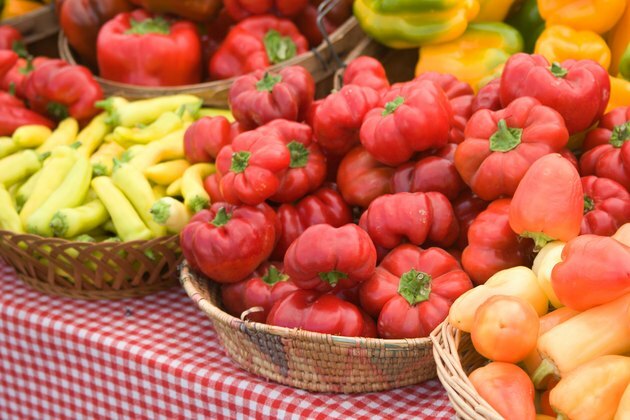 Annual vegetables common to home gardens, such as tomatoes, green beans, peppers and corn, do well anywhere in the state. Plant tomatoes (Lycopersicon esculentum) from May 5 to June 15. Try "Amish Paste," "Brandywine" or "Matt's Wild Cherry" varieties. Bush or pole beans (Phaseolus vulgaris) will adapt to Indiana's climate, particularly "Bush Blue Lake" or "Bountiful" (bush) and "Fortex" or "Kentucky Wonder" (pole). For best results, set bean plants out from April 25 to June 30. For bell peppers (Capsicum annum) that mature from green to red, try "Lady Bell," "Gypsy," "Bell Boy" or "Lipstick." Seedlings should be started indoors and transplanted May 10 to June 10. Plant sweet corn (Zea mays) from April 15 to June 15. Supersweet varieties, such as "Pristine," must be planted during the latter planting dates. However, "Iochief" and "Silver Queen," with normal sugar, can be set out earlier. 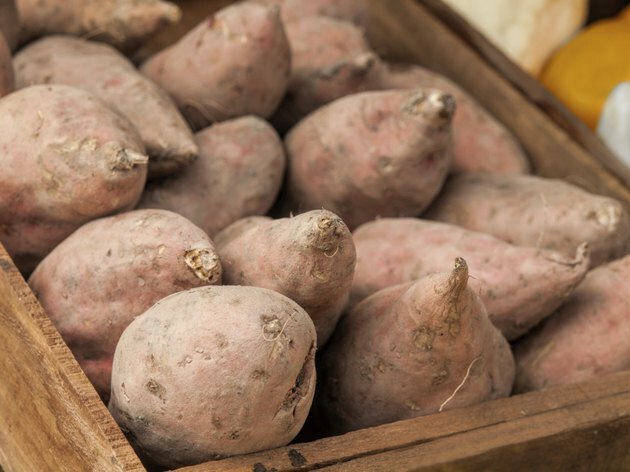 A wooden crate filled with sweet potatoes. Other crops fare best in certain regions of the state. Carrots, potatoes and sweet potatoes fall into this category. Since the carrot (Daucus carota) does not grow well in hot weather, gardens in USDA 5b support it better than those in more southerly parts of Indiana. Plant "Napoli' or "Orlando Gold" from April 10 to June 1. Northern Indiana also provides optimal conditions for growing potatoes (Solanum tuberosum). "Irish Cobbler" and the red-skinned "Viking" are two varieties to plant from March 20 to May 10. In the southern part of the state, sweet potatoes (Ipomoea batatas) thrive, especially the "Georgia Jet" and "Beauregard" varieties. Start them May 1 to June 1. Leeks, celery root and other garden fresh vegetables on a wooden board in the kitchen. Several adventuresome Indianapolis gardeners report successfully growing unusual, gourmet-favorite vegetables, such as tomatillo, leeks and celeriac. The crops began with seeds started indoors. After the soil warmed, growers transplanted them into the garden. The "Toma Verde" variety of the tomatillo (Physalis philadelphica) attracted bees and wound up as an ingredient in salsas and sauces. Allowing you to harvest them as needed makes leeks (Allium ampeloprasum) valuable in a vegetable garden. Celery root, or celeriac (Apium graveolens rapaceum), requires abundant water, but provides a tasty addition to Thanksgiving stuffing. The "Diamant" variety is recommended for Indiana. 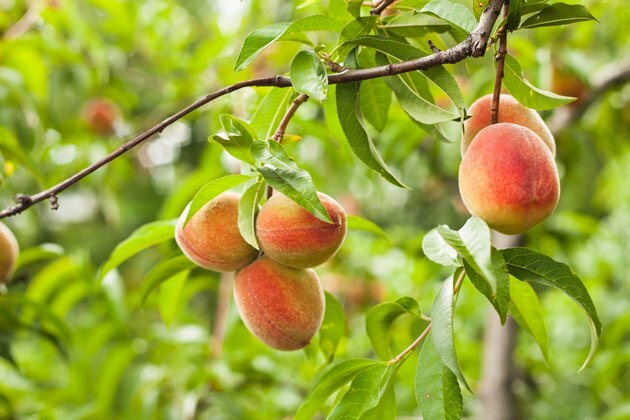 A close-up of peaches growing on a tree . For years of fruit harvests, plant apple (Malus domestica) or peach (Prunus persica) trees in your Indiana home orchard. Apples thrive in USDA zones 3 through 8, while peaches do best in zones 5 to 8. Choose a disease-resistant apple variety, such as "Liberty," Jonafree," "Macfree" or Williams Pride." White-fleshed, sweet "Saturn" peaches are ideal for USDA zone 6, or "Harmony" adapts well to the same area. Another perennial fruit, highbush blueberries (Vaccinium corymbosum), flourish in USDA zones 4 to 7. Try "Bluecrop," "Herbert," "Jersey" or "Meador." Watermelon (Citrullus lanatus) will grow throughout Indiana as an annual, but excels in the sandy soil of the state's southwestern corner. Plant the vines June 1 to June 15. "Sugar Baby," "Sweet Beauty" and "Golden Midget" varieties come recommended.